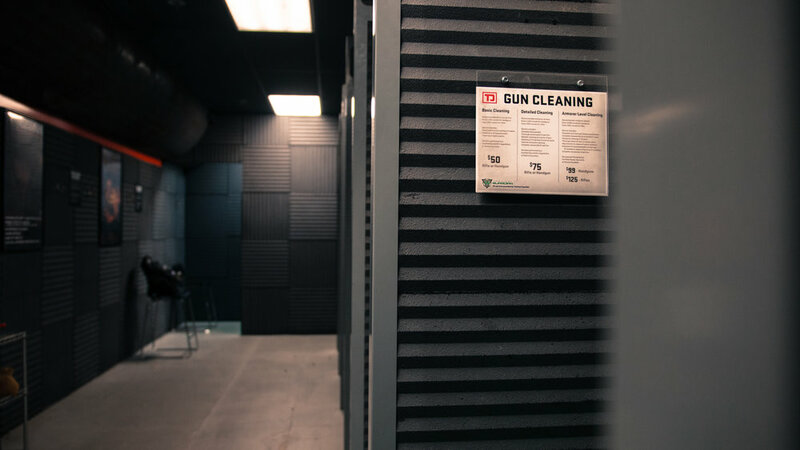 Threat Dynamics features a state-of-the-art facility with friendly and experienced instructors that are NRA certified. Minimum age to enter the live fire range is 12 when Accompanied by an adult. *WEEKENDS & HOLIDAY RATE $25 for 60 minutes - $10 per 30 minutes after that. then the $10 fee per 30 minutes applies after that. GUEST FEE $10.00 Per Guest. Maximum of 3 guests per lane. AMMUNITION IS AVAILABLE FOR PURCHASE IN OUR FACILITY. WE FEATURE OUR OWN LINE OF HIGH QUALITY TRAINING AMMUNITION MANUFACTURED ON LOCATION AS WELL AS OTHER STANDARD MANUFACTURES. NO OUTSIDE AMMUNITION IS ALLOWED FOR NON-MEMBERS UNLESS WE DO NOT HAVE THAT CALIBER IN STOCK. MEMBERS & FAMILY MEMBERS ARE ALLOWED TO BRING YOUR OWN AMMUNITION TO SHOOT BUT A $10.00 CHARGE WILL BE APPLIED FOR INSPECTION AND IS SUBJECT TO STAFF APPROVAL. SPARTAN MEMBERS PAY $5 FOR AMMUNITION INSPECTION. SPARTAN ELITE MEMBERS DO NOT PAY FOR AMMUNITION INSPECTION. NO PRE-LOADED MAGAZINES, AMMUNITION MUST BE INSPECTED PRIOR TO BEING LOADED INTO MAGAZINES. NO RELOADS, RE-MANUFACTURED, ARMOR PIERCING, INCENDIARY OR EXOTIC ROUNDS ALLOWED. ALL GUN RENTALS: MUST PURCHASE OUR AMMUNITION. (THIS HELPS PROTECT THE RELIABILITY OF OUR RENTALS). SHOTGUN AMMUNITION MUST BE BUCKSHOT, OR SLUGS. NO BIRD SHOT ALLOWED. ABSOLUTELY NO OUTSIDE TARGETS ALLOWED (for safety reasons). THESE POLICIES ARE SUBJECT TO CHANGE WITHOUT WARNING. PLEASE INQUIRE AT CHECK IN. .308 RIFLE CALIBERS AND SMALLER ARE ALLOWED INCLUDING ALL PISTOL CALIBERS UNDER .50AE. NO SHORT BARREL RIFLES OR PISTOL RIFLE CALIBER HANDGUNS. AS A CLASS III FACILITY WE OFFER A WIDE RANGE OF SUPPRESSED RIFLES AND PISTOLS FROM .22 LR - .556 CALIBER. THREAT DYNAMICS MAINTAINS A FULL STAFF OF HIGHLY TRAINED AND EXPERIENCED INSTRUCTORS. ALL OF OUR INSTRUCTORS ARE FORMER MILITARY, OR HAVE CURRENT OR FORMER COMPETITIVE SHOOTING BACKGROUNDS. ALL THREAT DYNAMICS INSTRUCTORS ARE CERTIFIED NRA FIREARM INSTRUCTORS. THREAT DYNAMICS OFFERS THE ABILITY TO DRAW FROM A HOLSTER ON OUR LIVE FIRE RANGE IF CERTAIN QUALIFICATIONS ARE MET. PLEASE CLICK HERE TO LEARN MORE ABOUT DRAWING FROM A HOLSTER ON OUR RANGE.